I'm working on a tea pot mini album for a family friend. The mini shape is a chipboard album from Michael's that you can find in the dollar bins. I've heard that some are finding them for $.50. Supplies for mini cover: K&Co. Black and Ivory pattern paper, Prima Lace (thanks T), Thicker raw chipboard, Black and Bronze Martha Stewart extra fine glitter, Vintage Cream Paper Trey Ink cardstock, Tea Pot chipboard shape, Black Soot Distress Ink. that's really cute, I have made several shape album from the michael's bins and your idea sounds much easier than cuting them all out, it's so time consuming and then they don't always line up right either, i'm going to try this, it's a great idea!! That teapot album is so adorable. I bought the same one from Michael's but paid double the amount. (-: What are ya gonna do? I hope we get to see the inside of your album. I love it. I won't be working on this one right now. I also bought the house. My daughter is buying her first home and I thought I'd surprise her with that mini-album. GREAT IDEA for using the X-acto knife to cut out the shapes - I've tried scissors and had a hard time! Thanks for sharing that tip! Cute card, BTW!! 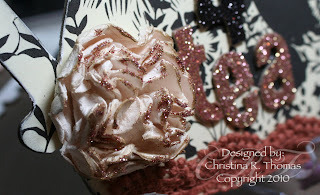 LOVE the flower, can't wait to see the video on how to make it. I have to tell you, I'm working on my very first mini album and it's all your and TeriB's fault!! Although, mine looks pretty kindergarten at this point in comparison. I'm having fun with it though. Thanks for all of the inspiration!! Kristina it's an addiction girl, after you do your first, it's all you will want to work on!!! This is just adorable and I will be back to see how you made that beautiful flower!!! Thanks for sharing with us. this is soooo beautiful!! Those colors are very rich looking~ I just LOVE it!! looking forward to the video tutorial for the flower, it is gorgeous. I looked around at Scrapbooking Alley today. Some some nice things on sale there - no sales tax is always nice and shipping is VERY reasonable. What is a good paper stack too buy that has alot of variety? There are sooo many. I love it!! I cannot wait for the flower video I love the last one you posted!!! Great t pot card. I love seeing people that are able to accompllish so much. I love your mini albums! I just finished one for my sister. I went to Michaels right after I saw your first one and picked up about 5. Went back last week for more and the store was out. Had to go to another store and buy out what was left! I am in love w/ your flower. I can't wait to see how you made this. It totally blew me away when I read it wasn't a Prima. wow.wow.wow. 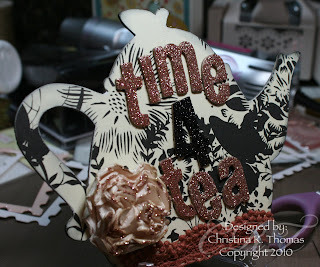 I love tea pots so i LOVE this mini and i love the flower, cant wait to see the video. I started picking up some of these albums at christmas...but haven't started one yet. little scared maybe? Afraid of what it may look like! LOL Do you put mod podge over each section? Is it ok to mod podge over pic's? Please let me know. Thank you! !